This January I wrote a three part series of what I wanted to put up this growing season. Let's see how I am doing. I am absolutely certain that I am way behind. I knew having a baby would complicate things but I didn't understand just how run down my body was going to feel. Up until this my body could do everything I asked of it. Even the couple really crappy long hikes in the rain while sick to get to out of a community to find transportation during Peace Corps were nothing compared with trying to weed in the garden while 38 weeks pregnant! My least favorite part of having a baby was the last month of pregnancy and the first six weeks postpartum. My physical abilities were so limited. I completely missed strawberries and blueberry season. The peach blossoms got zapped in a late frost so I'm not sure I'll find peaches this fall either. I guess the only fruit I'm getting are apples! I'll have to see if I can find some pears too. I did manage to collect all the jars I thought I would need. Although, I'm almost out of pint jars! I did meet a lovely elderly gal at the farmers market who sold me 50 quart jars for $12.50. You can't beat that, so I think I'll have enough to make it through. Most of them are old glass mayo jars, which are fine for the refrigerator or water bath canner, but not so much for the pressure canner. That's okay because I still don't have a pressure canner. Another thing I don't have is a chest freezer. I was counting on buying a freezer to store the frozen stuff and that hasn't happened. Turns out a new house and birthing a baby are expensive and on a high deductible health savings account plan a baby counts as her own person and has her own deductible. If I hadn't been moved to a hospital the babe wouldn't have had any cost. (I risked out after 24 hours of my water breaking when birth was not imminent at the birth center. Here's more info if you're curious.) So that cut into our savings. All is well that ends well, right? Healthy baby, healthy mom; just no chest freezer. Next year perhaps. For the record, the baby is only up on the counter for the picture. What has been on track? Pickles! As you can see from the picture above, I've got all the pickles I planned to done. We prefer refrigerator dill pickles so that's what I've got. I also came across a recipe for pickled red onions and made a bunch of those. They have replaced grilled or sauteed onions on our sandwiches and brats. I'm even trying a quart of sauerkraut. I'm two weeks into a six week ferment, so we'll see how that goes. 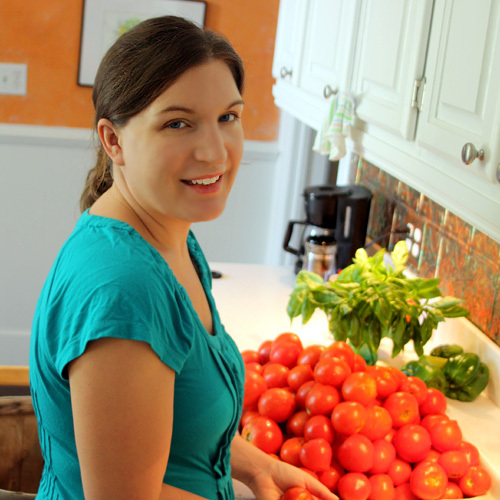 Then I saw this recipe for Home Canned Tomato Soup and now maybe I could use even more tomatoes! We'll see what the availability is at the co-op this year or I might have to buy another couple bushels. I tried dehydrating kale and beets and came to the conclusion that I just don't like them that well. I'm now thinking I should blanch and freeze kale and Swiss chard in one pound bags to use for vegetarian lasagna and soups. Again, it would be good to have more freezer space. There are some things I can still get done this year like winter storage of garlic and winter squash. I still have pesto and dehydrated tomatoes to make as well as grape jelly. The season is anything but over, perhaps there is still time to get a chest freezer! 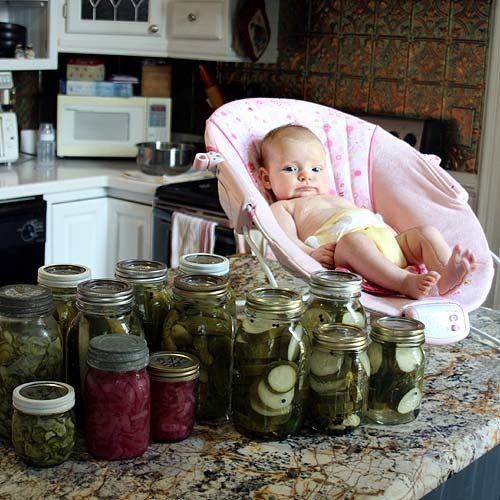 How's your home food preservation going? Hi Foy! Stephen's parents gifted us a freezer last year for Christmas. They got a really good deal at Best Buy so you might want to check there if you are buying new! I am horrible and sometimes forget we have it since it's in the basement, out of sight out of mind. If you ever are in a jam and need quick storage we don't mind and usually have the space! Thanks Emily! I was thinking Lowes or Homedepot, I never considered Best Buy. I'll check them out! Babies have a way of making the best laid plans fall by the wayside - but like you said, healthy mom & baby and that's all that matters. We have a stand up freezer in the garage and I couldn't get by without it. I try hard to buy meat when it's on sale and there's no way I could fit it all in our house side by side. Have you tried craigslist? I know sometimes you can score a really good deal. I should look at Craig's List. I was hoping to get a newer one with energy star ratings so that it wouldn't cost as much to run. Perhaps I'll find a good one - you never know. Just found your blog, great read! We invested in a chest freezer last winter for around $150 and it was well worth it. I've already got a ton of freezer jam, frozen blackberries/blueberries and spaghetti sauce frozen and ready to go for the rest of the year. You all are going to wear me down. I may get a freezer yet! I'll just have to do some balancing of the budget. First time visitor to your blog and it looks great!! 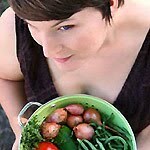 I admire your mound of tomatoes in that first photo!! We live in Alaska where tomatoes, even this time of year, are nearly $3 a pound!! Love that you found me! Well I bet you have great cool weather crops in Alaska and great hunting that surpass little old Indiana. Found you on the Garden hop! I'm thinking I will just change what I planned on using it for. It will become lasagna or spaghetti sauce and I'll make another batch of pizza sauce. You're right, why go to all that trouble if it is still usable. I just need to change my frame of reference. Thanks! Check out my blog, its not quite as up on my processing as I would like it to be...but Ive got some great recipes and garden pics. I will defiantly be back! Glad you found me and I found your blog! We have a dearth of patty-pans at the Co-op and the share holders are asking what to cook with them. I'll pass along your recipe! I'm hoping next year is my year to harvest and preserve. As for this year, I just bought 60 lbs of heirloom tomatoes from our CSA, I thought that was ambitious until I read your 200 lbs! I've processed about 40 lbs so far, I even squeezed out the juice prior to making tomato sauce so I have several quarts of tomato "juice" that I will use as a base for soup or something sometime over the next year, unless it turns out horrible! I'm tempted to put the last of the tomatoes in the freezer even though it is awfully small. Congratulations on your baby, that's very ambitious of you to try to get anything done. This is really wonderful and a great mommy resource. Thanks for linking it up to Mommy Solutions. I am going to be featuring you today at 3pm on my Facebook page! woot! I LOVE the goal sheet. 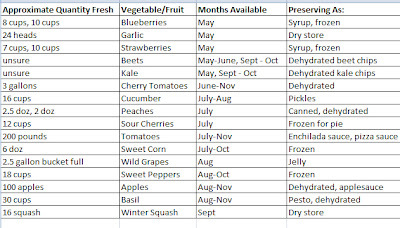 I think I am going to do one over the winter this year as I dream about my next harvest. Your little one is just precious looking at all those beautiful jars of canned food. 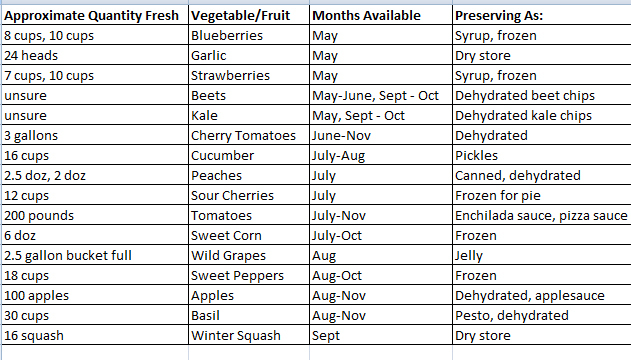 I keep a garden and canning journal and it is a great record from year to year for amounts and seasonal produce that will be available. This is a great post! Hope you have a great holiday weekend and thank you so much for sharing with Full Plate Thursday. What a great preserving resource this post is, with links to lots of lovely recipes as well! Your baby is adorable!